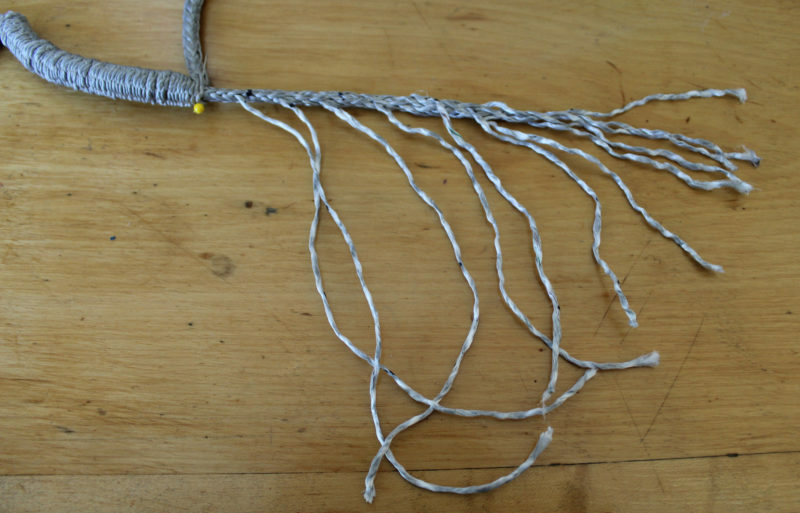 Dyneema rope, with spliced-in stainless-steel thimbles and simple lashings, makes strong, do-it-yourself standing rigging. For small boats with standing rigging, steel was once the only choice, and it had to be ordered from a rigging shop with its fittings installed. In recent years Dynex Dux and STS, made from Dyneema SK-75 high-modulus polyethylene (HMPE), have become available. While high-strength fiber rope has been around for some time now, it was very expensive and available for large yachts only. It now costs about the same as stainless-steel cable, and the fittings used with it cost less than turnbuckles and toggles. These ropes have low-stretch characteristics similar to those of stainless-steel cable, are lightweight and soft, won’t rust or scar brightwork, and can be spliced easily without special tools. 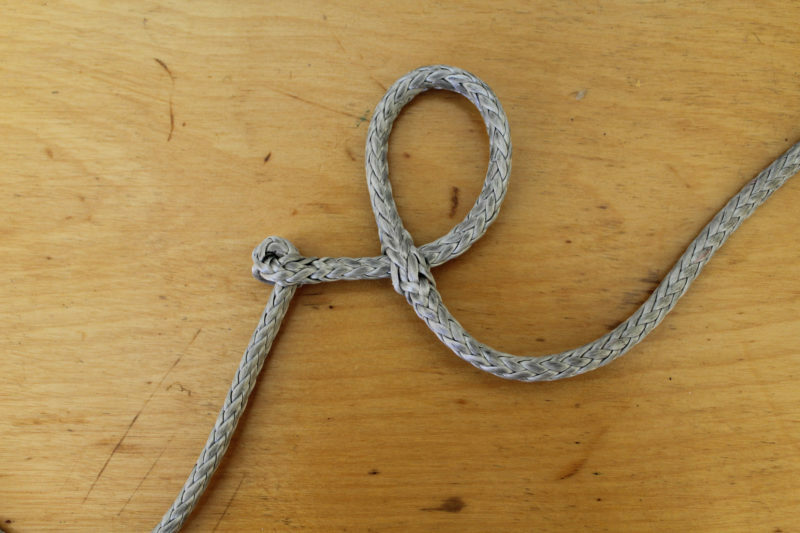 For trailer sailers, these synthetic ropes will not kink and are easier to coil up and stow when the mast is down. HMPE braided rope is stronger than steel cable, but it initially has some “constructional stretch” as the fibers are squeezed into a tighter braid as load is applied. Once the settling is complete, the rope only exhibits “material stretch,” the characteristic of the fiber from which it is made. Dynex Dux and STS have had the constructional stretch removed in the manufacturing process by being subjected to heat while under tensile load. Another stretch characteristic of these ropes, called creep, is the elongation over time when under load. Creep is virtually nonexistent in steel cables, but is measurable with synthetic fiber ropes. For both Dynex Dux and STS, the amount of creep in normal usage on small boats will not be a factor. Highly stressed, tall rigs with high standing preloads may require an occasional tightening, but for most small craft with relatively floppy rigs, or trailer sailers that are tensioned every time the rig mast is set up, it is insignificant. The HMPE rope can be a direct replacement for steel cable, and the tensioning hardware can be changed to less expensive lashing lanyards. 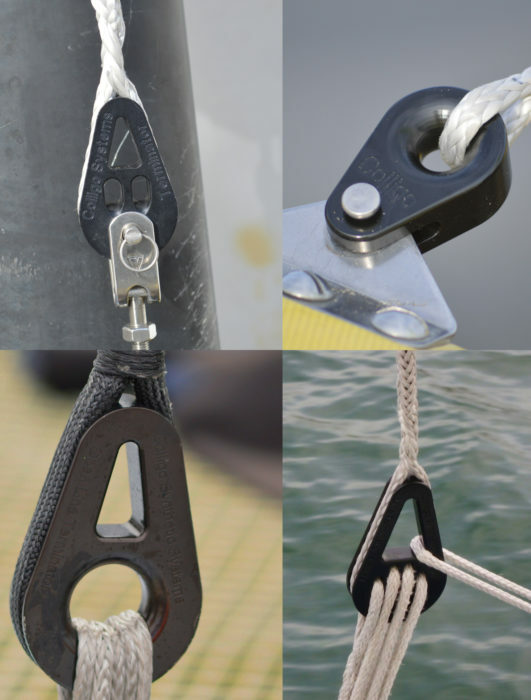 Colligo Marine offers an array of special thimbles, deadeyes, and other terminals designed for fiber rigging so a do-it-yourselfer can make shrouds and stays. Many of these fittings are designed to connect to existing tangs and pins for direct replacement of metal cables. A few of the Colligo fittings designed for use with Dyneema line. 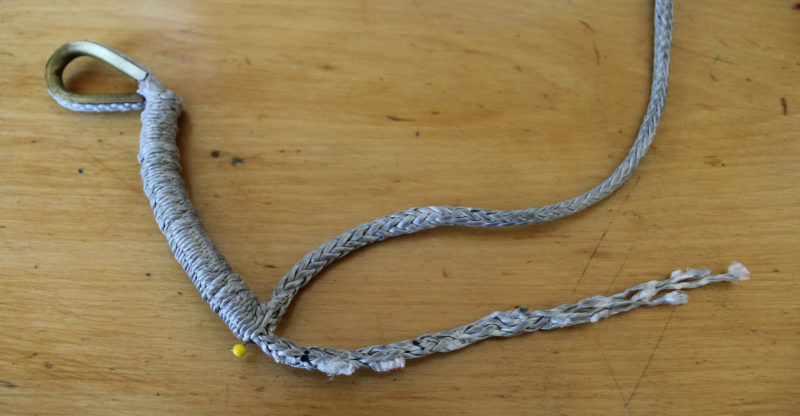 For small boats, the stainless-steel rigging cable can be replaced with Dyneema SK75, Dynex Dux, or STS fiber rope of the same diameter as the metal cable. The fiber rope will be 50 percent stronger with similar stretch characteristics. The minimum diameter for Dynex Dux is 5mm; for SK75 Dyneema or Amsteel line it’s 3mm (1/8″). 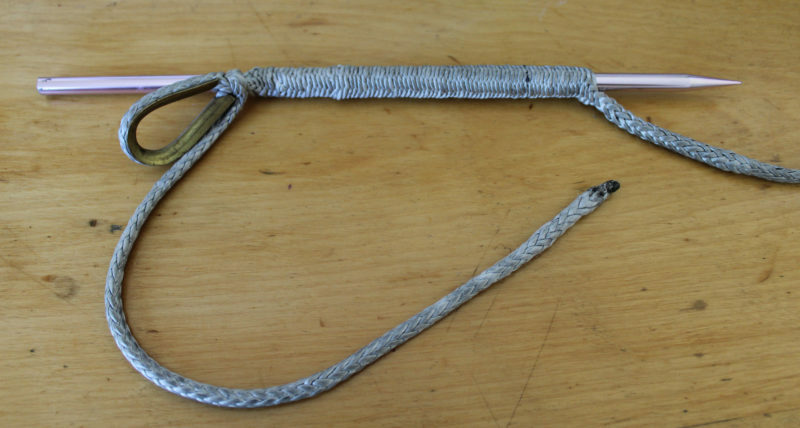 Amsteel isn’t heat treated, so use a size larger than metal cable to offset the additional stretch. For thimble terminals, use heavy-duty terminals or complete ring sailmaker’s thimbles about 50 percent larger than specified for the line diameter, for extra strength and to give a larger bearing surface for the lanyard. 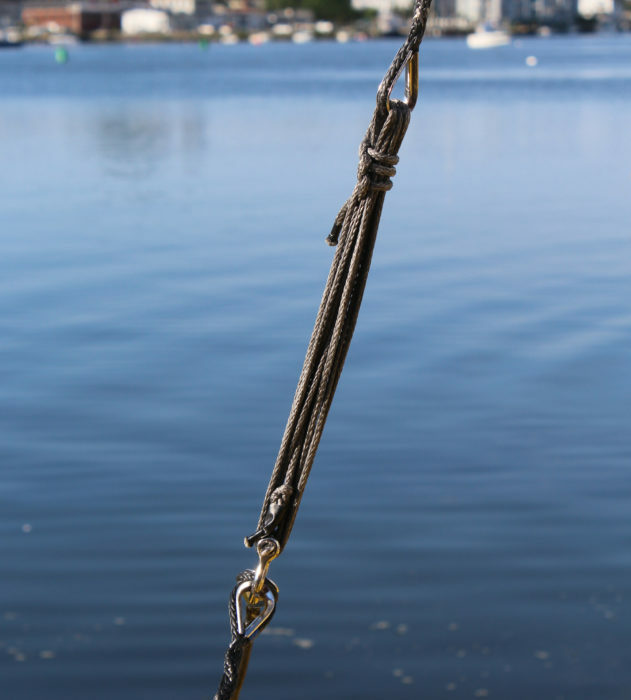 If the rope is larger than 3/16″, consider using the Colligo Marine Terminator fittings with tensioning lanyards. Colligo Marine offers lashing and splicing instructions and other helpful videos on their website. High-strength fiber rope offers an attractive rigging system for replacement of metal cables or original construction. 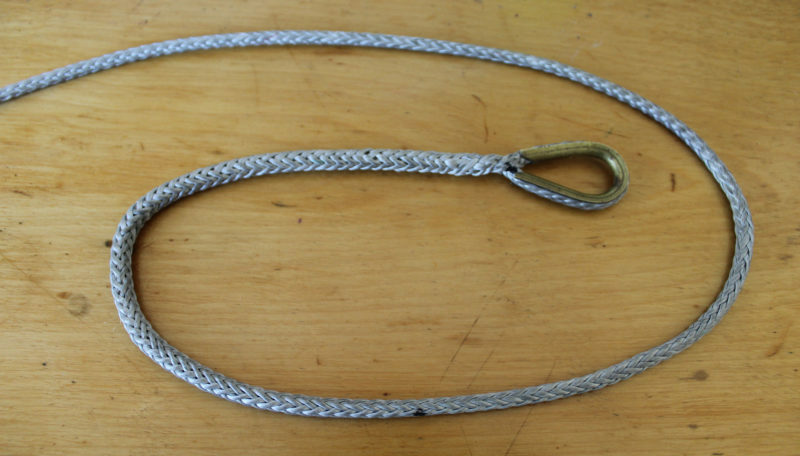 It costs about the same as stainless-steel cable, and the fittings cost less than turnbuckles and toggles. 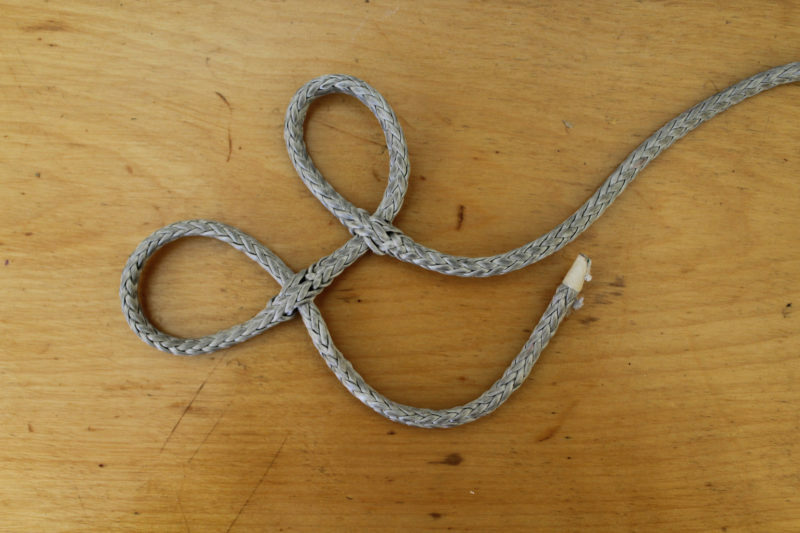 It is easy to splice, so the boat owner can make up cables to length very quickly. Colligo Marine is currently claiming a working life for of 8 years in the tropics, more in northern climates. Stainless-steel rigging typically lasts 20 years, but has been known to fail at the terminals in less time. 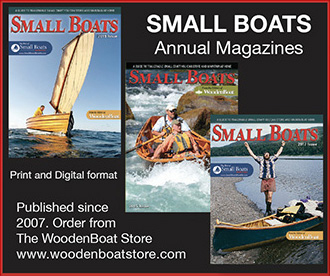 For small boats that are often covered when not in use, the life of the fiber rigging is greatly extended. John Marples has designed, built, and rigged many sailing vessels. His portfolio includes dozens of wood-epoxy composite sailing and power multihulls to 65′. He operates Marples Marine, a multi-hull design and engineering firm in Penobscot, Maine. 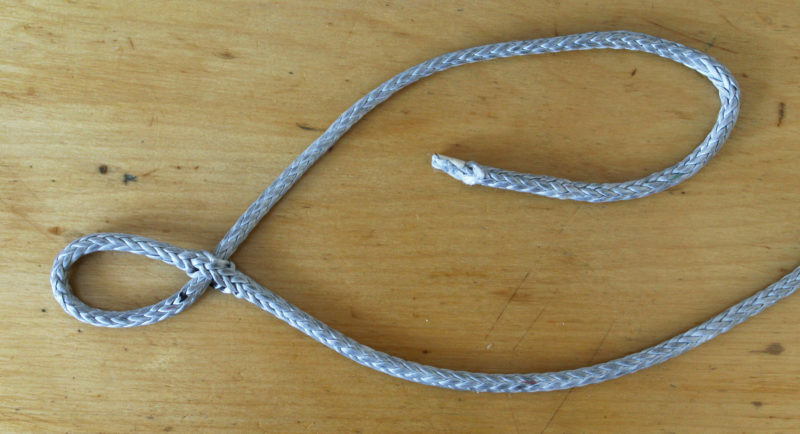 The Brummel eye splice is commonly used for Dyneema rope. 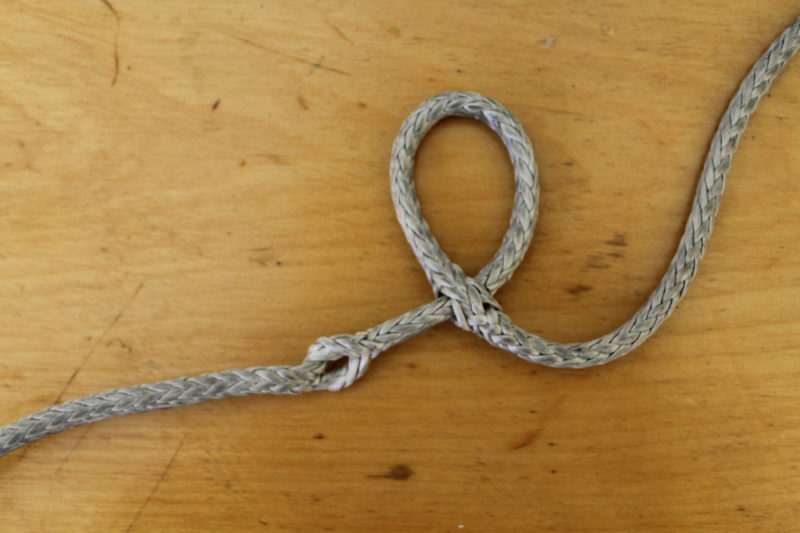 Passing both ends through the rope at the base of the eye locks the slippery braided line, and then a long tapered tail is buried inside. 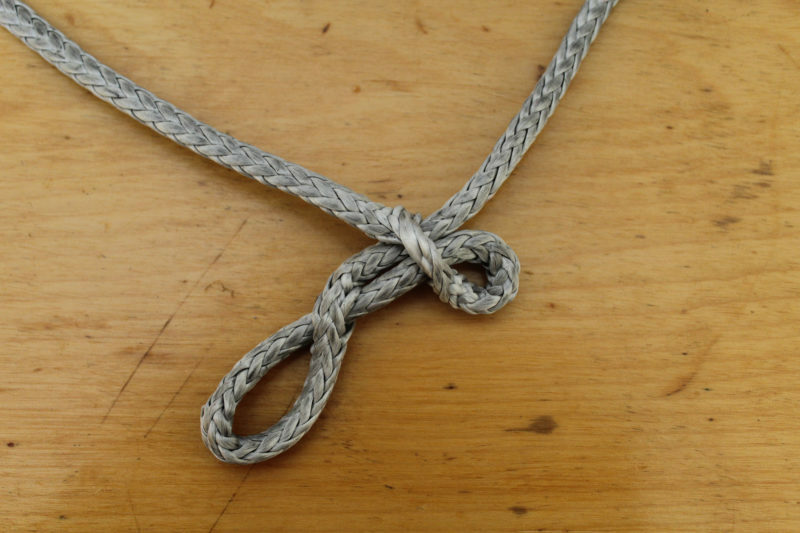 The simple Brummel splice works as a first splice because both ends can be threaded through. 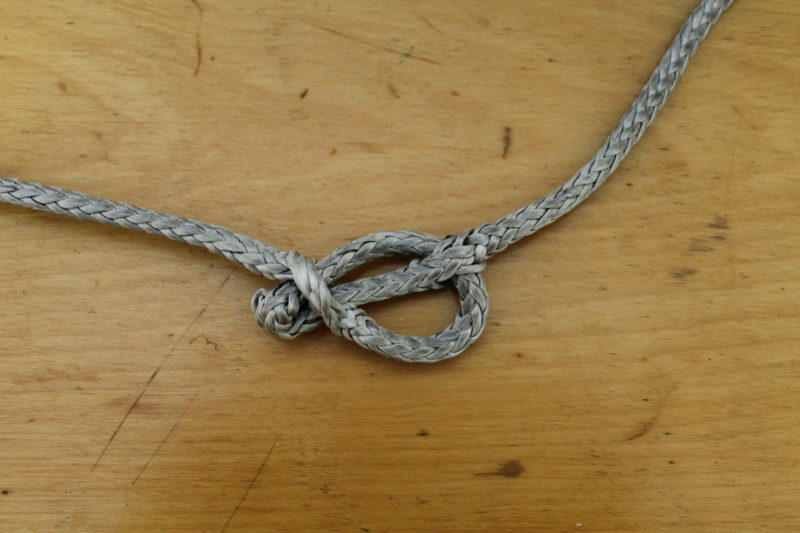 The second splice, on the other end of the line, requires a different technique because the eye can’t be passed through the braid. For details, refer to the Colligo Marine videos. 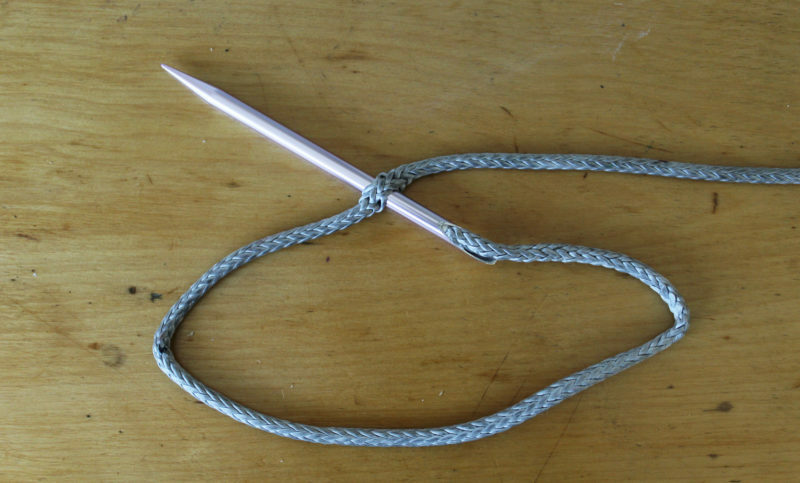 If you don’t have fids for braided line you can make them from aluminum knitting needles. Here a length of 3/16″ Amsteel line is going to be spliced around a brass thimble. The bight is pinched around the thimble and marked where the two sides come together. The tail that will be buried in the core of the line at the end of the process should be 72 times the diameter of the line. Prior to inserting a fid, the line is pushed together to open the braid. The black mark made in the previous step is visible here in the middle of the loosened braid. 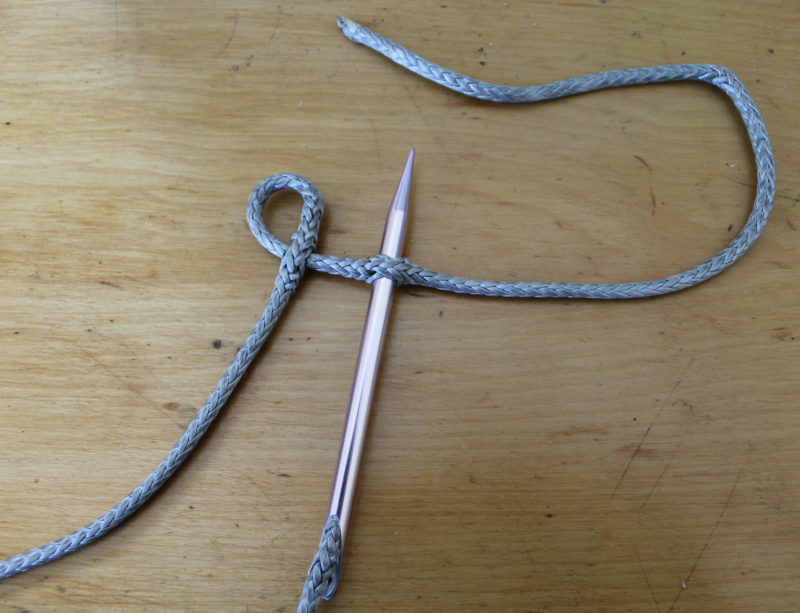 The fid takes the end of the line through the loosened braid. The end of the line is pulled through until the marks meet each other. The end of the long side of the rope is threaded through just below the mark. The line now has each end threaded through, and when the eye is opened up for the thimble, the intersections will lock against each other. The eye needs to pulled open forcefully to get thimble snapped in. 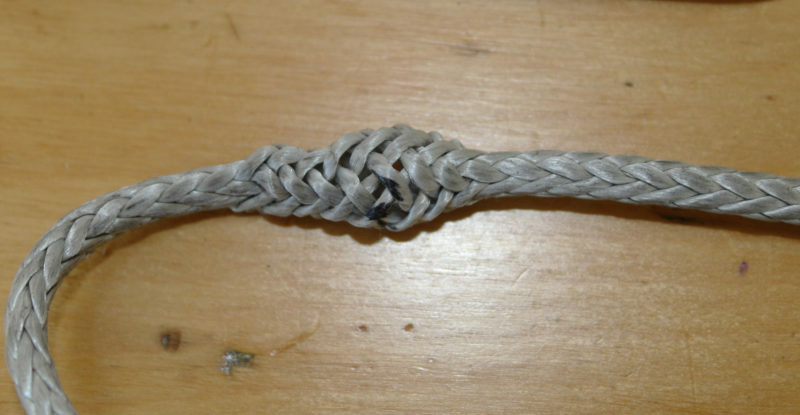 To make room for the end to be slipped through, a fid is pushed down the center of the line, loosening the braid. The fid emerges after it has passed through several more inches of line than the tail will occupy. After the fid is removed, the braid remains loose. A bit of tape around the end of the line stiffens it enough to slip through the loosened braid. The loosened braid gets pushed over the taped end. When the tip emerges from the opening left by the fid, it can be pulled out. 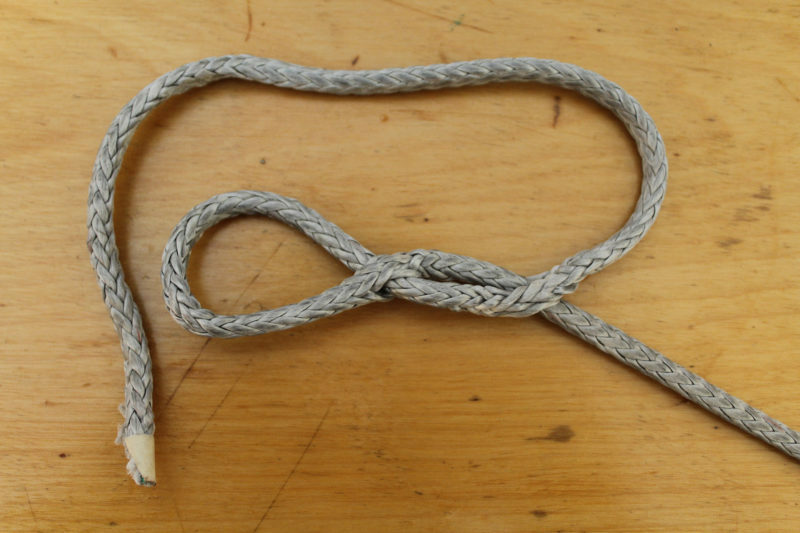 With a straight pin holding back the loosened braid, the tail is marked in 12 equal increments. A single strand is pulled out at each mark. When all 12 strands have been teased out, they are each cut with a sharp knife or scissors. After the strands are cut the tail has a uniform taper. 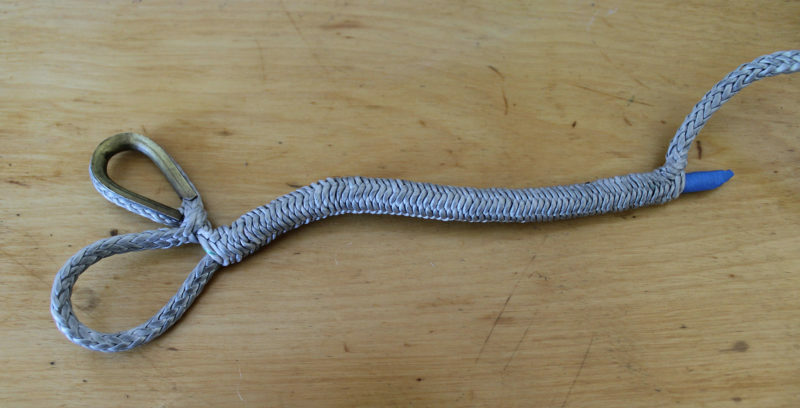 The pin holding the loosened braid back will be removed so the tail can be pulled into the line. As the braid is pulled out, the tail disappears inside, leaving a long gradual taper away from the thimble. Reader Anthony Johnson asked how an eye can be spliced into the other end of the line if the long end can’t be passed through the hole. You could create the second eye in the same manner as described above, by installing the thimbles only after both eyes have been created. 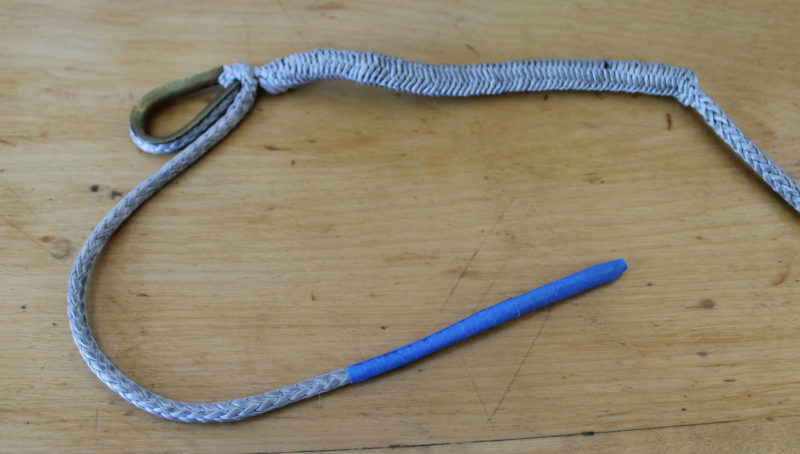 To make room for the first eye splice, enlarge the hole in the second eye splice that the long end passes through by prying two fids against each other in it. For occasions like Anthony’s stanchions, where the long end can’t be passed through the hole, there is the modified Brummel eye splice, illustrated here. The eye for the thimble is to the right. At the point where an opening has been made to run the long end of the line through in the standard Brummel, the short end is inserted instead. The short end is pulled to shrink the loop. As the short end is pulled further, the loop disappears and the hole it has been passed through becomes inverted. After widening the inverted hole with a pair of fids, the thimble’s eye is passed through. Continuing to pull the eye through creates a small loop that will get pulled through the inverted hole and undo the inversion. The hole is now back as it started but with the long end of the line running through it. Colligo Marine has a nice video of the modified Brummel eye splice. Wonderful article, full of practical wisdom, as I have come to expect from this great e-zine! When the rigging on my Compac 19 needs replacing I will definitely look to Dyneema. 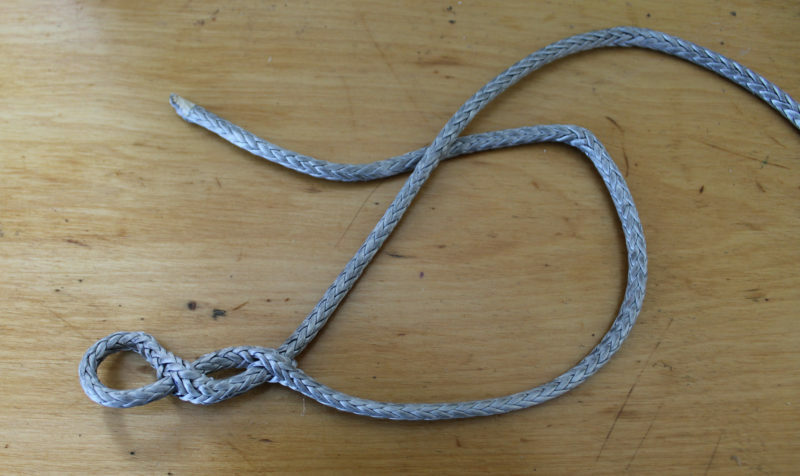 The primer on how to achieve a Brummel eye splice was very clear and seems achievable, even for a lamentable amateur such as myself. I am off to my local chandler to purchase a fid and a length of Dyneema. I am in the planning phase of building a wooden lugger. The mission of repairing/replacing shrouds on my father-in-laws Drascombe lugger and having to secure the use of specialist equipment and services was a bit of an unnecessary irritation. I will be using this product. The illustration is very clear and easy to understand. What is the preferred method for trailer sailors who rig and tension shrouds each time, currently with turnbuckles? Any of the modern deadeye and lanyard systems seen above work for tensioning shrouds. With a shackle and pin in the system, or pin and rack, one can put it together quickly leaving the headstay the only adjustable bit of standing rigging needed. This can be done with deadeye and lanyard or a small tackle. Or if you would rather tension the shrouds each time you set up, it is easy to mark them with a marker or whipping. I used Spectra for the standing rigging on my Welsford Navigator in this issue. Love the stuff. Easy to work with. Nice hand. Easy to splice. I used closed stainless turnbuckles for tensioning. Very simple and effective. I just replaced the SS lifelines on my Ericson 27 with Dyneema. It was very easy to do and I get many compliments from the other boat owners at our marina. I purchased the entire kit and two gate kits from Defender. Anyone know where you can get brass thimbles? I took a look on the web and they’re not so common has they used to be. The one I used in the photos had been in my ditty box for over 30 years. This above photos clearly show how to start a line that is free at both ends. But if you are making safety lines and have to run a free end through a series of small stanchion holes, how do you close out a thimble around a fitting at the free end? Good question. 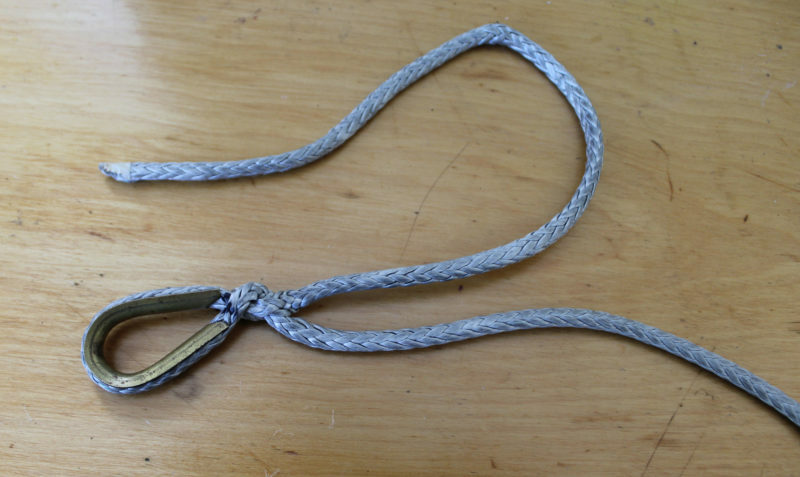 I’ve added the steps for the modified Brummel eye splice to my notes following the article.